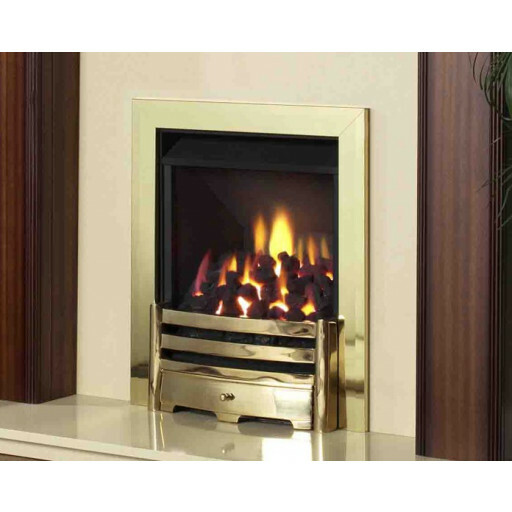 Anyone who owns Legend Spirit Superslim gas fire should consider installing the attractive Legend Spirit Superslim traditional trim set package. This lovely metal accessory fits the exterior of the fire, showcasing the beautiful display within to its best advantage. The manufacturer utilises exclusively high quality materials in crafting this elegant decorative accessory. It conveys a prosperous, refined appearance to hearths in homes and commercial establishments. The stylish Legend Spirit Superslim traditional trim set includes a strong Aviva fret in the centre. Customers selects from four available colour finishing trim options: Black, Brass, Brushed Steel, or Chrome. Whether decorators rely upon a contemporary or a traditional motif, this accessory enhances the appearance of your existing gas fire. The shining metal surfaces reflect the flickering and realistic flame effect in an appealing manner! Some customers select a trim colour package for their Legend Spirit Superslim traditional trim set based primarily upon the enhancing the visual appeal of the surrounding room. For instance, the Brass Trim package complements brass more traditionally decorated rooms. Every version of the Legend Spirit Superslim trim set provides a stunning focal point to any room in which your existing fire is installed.